A fumes event involving a German Boeing 757 in 2013 led to the serious illness of two flight attendants, according an interim statement of the Spanish accident investigation bureau CIAIAC. 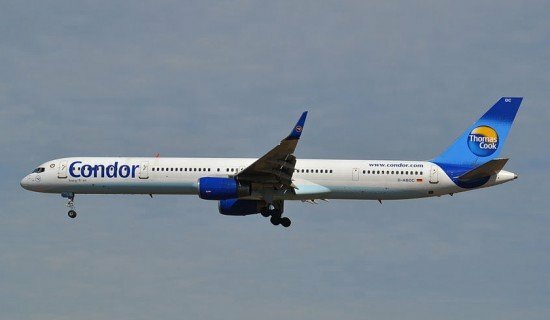 The aircraft, a Boeing 757-300 (D-ABOC), operated by German airline Condor, took off at 10:44 UTC on 22 March 2013 from Hamburg Airport, Germany with destination Gran Canaria Airport, Spain. The aircraft was subjected to a deicing treatment right before the take-off. On board there were 8 crew members and 233 passengers. The take-off, ascent and cruise phases went uneventful and the aircraft started its approach to destination airport. While descending, at an altitude of about 6000 ft, the flight crew noticed a strong smell that seemed to be originating from the air conditioning system outlets. Immediately afterwards the purser called the cockpit to state that also in the passengers cabin a strong smell was being perceived too. About 2 minutes later, the first officer stated to the captain that he felt a bit physically insecure as he noted a slight dizziness. The captain suggested him to use the oxygen mask. The first officer agreed and donned it, noticing an immediate improving. The crew performed the landing without further notice and the first officer took off his mask during taxi. While preparing the airplane for the flight back to Hamburg, the company’s maintenance department gave instructions to their technicians to check the engines for a possible bird impact and also the oil and hydraulic levels, the water/waste driving lines and the HEPA filters. No anomalies were found. After that, the crew decided to undertake a test of the air conditioning system. Onboard were the whole crew, a maintenance technician and an operator from the company’s base in Gran Canaria. Each member of the crew was at their pertinent position to immediately report any anomalies. The APU bleed and the left pack of the air conditioning system were connected. Right after that a strong smell was noticed, and seconds later the crew reported that the two flight attendants at 2L/R were having physical problems. They immediately disconnected the air conditioning pack and the APU bleed and opened all the aircraft’s doors to ventilate. Oxygen was given to the two flight attendants and an ambulance was requested. The affected members of the crew were evacuated to the airport medical services where they were attended first, being transferred to a hospital afterwards. In April 2013 the health of one of the flight attendants who had been onboard worsened, requiring hospitalization. The symptoms presented were overall muscle fatigue, in particular proximal of the lower limbs, difficulty walking, sensory disorder, trouble concentrating and general fatigue. She was released from the hospital and continued treatment on an out-patient basis. The symptoms persisted and her health did not show improvement, even worsening at times to the point where she had to be hospitalized. Early 2014 she still has not been able to return to work. Although the tests performed on her have not been able to identify the cause of the symptoms afflicting her, the medical report from the hospital indicated poisoning caused by some type of neurotoxin. The other flight attendant who was also affected during the same event has likewise been unable to return to work. Following the fumes occurrence the airplane was subjected to numerous tests without finding the origin of those fumes. On 26 March, four days after the event, a positioning flight was made by a full crew, different from the one involved in the event, to transport the airplane to Frankfurt, where the operator is based. Onboard were also airline technicians who had traveled to inspect the aircraft, as well as all the equipment they had taken with them, which included Aerotracer and GrayWolf sensors, which were in use the entire flight. Around 1:40 h into the flight, they entered an area of slight turbulence, immediately after which an odor filled the entire cabin that was so intense that the pilots decided to don their oxygen masks. Even so the first officer felt his tongue going numb and irritation in his throat. These same symptoms were also reported by the purser. The turbulence stopped after about 10 minutes, with the odor disappearing immediately afterwards. The pilots removed their oxygen masks. The symptoms affecting the tongue and throat of the first officer and purser likewise disappeared. While descending into the Frankfurt Airport the odor returned, and both pilots once more donned their oxygen masks. The purser felt her fingers go numb. The odor cleared up by the time they reached 6000 ft and the landing was completed without further incident. None of the other people onboard noticed any physical symptoms during either of the two odor events that occurred during the flight. Neither the GrayWolf nor the Aerotracer sensor indicated the presence specific compounds from aviation products at any point during the flight.